The National Religious Party (Hebrew: מפלגה דתית לאומית‎, Miflaga Datit Leumit, commonly known in Israel by its Hebrew acronym Mafdal, (Hebrew: מפד"ל)) was a political party in Israel representing the religious Zionist movement. 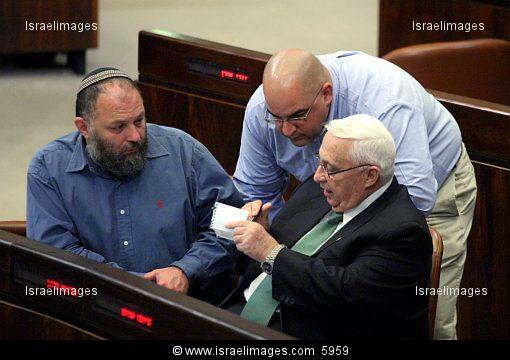 Efraim "Effi" (Fine) Eitam (Hebrew: אפרים "אפי" איתם‎, born 25 July 1952) is an Israeli politician. A former leader of the National Religious Party, he later led a breakaway faction, Ahi, which merged into Likud in 2009. 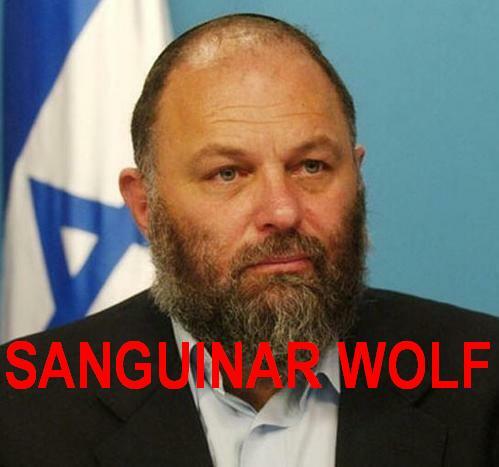 He served as a member of the Knesset between 2003 and 2009. The Israeli left wing sees him as a nationalist zealot and some have accused him of being a fanatic or a self-proclaimed Messiah. An interview that may have provoked these accusations was one in which he was quoted as saying "I have a dream to lead the entire Israeli people. I think it is my destiny". Eitam has responded to this with, "I came to lead, not to do petty politics." Arrogant: making claims or pretensions to superior importance or rights; overbearingly assuming; insolently proud: an arrogant public official. Eitam has called Israeli Arabs a "cancer": "The Israeli Arabs are in large measure the ticking bomb beneath the whole democratic Israeli order inside the  Green Line. Even today, in the Galilee and the Negev, a de facto autonomy of theirs is being created, which could in practice turn Israel into the bubble of Metropolitan Tel Aviv .… Therefore, I say that the State of Israel today faces an existential threat that is characterized by being an elusive threat, and elusive threats by their nature resemble cancer. Cancer is a type of illness in which most of the people who die from it die because they were diagnosed too late. By the time you grasp the size of the threat, it is already too late to deal with it.". Commenting on this, the veteran Israeli journalist, Akiva Eldar, wrote in Haaretz, "The fact that the Nazis were especially fond of this [cancer] metaphor is probably not lost on the general." In 2004, Eitam called the Palestinians "dark forces" and said "We will have to kill them all"
Extremism is any ideology or political act far outside the perceived political center of a society; or otherwise claimed to violate common moral standards. In democratic societies, individuals or groups that advocate the replacement of democracy with an authoritarian regime are usually considered to be extremists, in authoritarian societies the opposite typically applies. In 2002, the Israeli Army used Nidal Abu Muihsein as a human shield, causing his death; Eitam called this “very moral.”In October 2005, Eitam opposed a Supreme Court of Israel ruling that banned the IDF from using Palestinians as human shields, stating that "Supreme court judges demonstrated today that their pity for the cruel will prove cruel to the merciful and will expose Israeli soldiers to more danger". In November 2006, he called for an expulsion of most Palestinians from the West Bank: "Expel most of the Judea and Samaria Arabs from here. We cannot be with all these Arabs and we cannot give up the land. "In March 2008, he called for the expulsion of Israeli Arab members of the Knesset, "One day we will expel you to Gaza from this house and from the national home of the Jewish people." In February 1988, Defense Minister Yitzhak Rabin discreetly told the Israeli army to break the bones of Palestinians rising up during the first Palestinian intifada. According to the testimony of Israeli soldiers, Colonel Eitam relayed the message to his Givati Brigade, then occupying Gaza. On 7 February, he ordered four of them to break the bones of two brothers from al-Bureij refugee camp. They cuffed and blindfolded them, beat them for a while in their own home, then took them to a secluded olive grove, where they kicked and beat them for 20 minutes. Khalid Aqel survived; his 21-year-old brother Ayyad died. In 1990, an Israeli court martial convicted these soldiers of assault, reduced their ranks, gave suspended sentences to three, and sentenced the fourth to two months ("Soldier jailed for intifada killing will sue Rabin," Guardian, 2 November 1990).